The latest release of dlib is special. It completely removes the boost.python dependency, making it significantly easier to install across the board on macOS, Ubuntu, and Raspbian. …with less dependencies and an easier install process. These install instructions are complete, easy, to follow, and will get you up and running with dlib + Python bindings in a manner of minutes. To learn how to install dlib on your system, just keep reading! 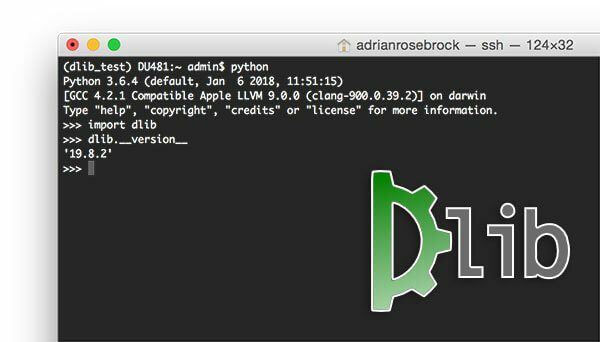 In this guide you’ll learn how to install dlib on macOS, Ubuntu, and Raspbian. Please feel free to skip to the section that corresponds to your operating system. Once you have installed dlib on your respective operating system we’ll validate the install by using Python, dlib, and OpenCV (provided you have OpenCV installed as well), to detect facial landmarks. 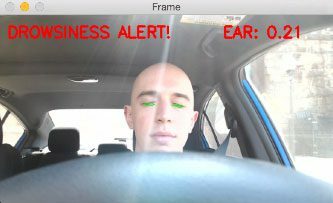 From there, I have provided additional tutorials and guides to help apply dlib to computer vision and machine learning projects, including detecting and counting blinks and building a system to recognize when the driver of a vehicle is becoming drowsy/tired (and alerting them to wake up). I’ll assume you already have XCode installed on your macOS machine. If not, please take the time to open the App Store and install XCode. Note: Make sure you use the “<>” button in the code block above to expand section — this will ensure you copy and paste the entire Homebrew install command. There are two key points you need to pay attention to here. The first is that you want to ensure the root path for both Python binaries are in /usr/local/bin — this is where Homebrew stores the Python binaries. If your root path instead reads /usr/bin then you are utilizing the system Python install. We want to avoid using the system Python install so if you see /usr/bin instead of /usr/local/bin then it’s most likely due to an error updating your ~/.bash_profile (make sure you go back and ensure the file has been updated properly; this could require manually opening and editing the file). The second key point to investigate is the Python binary itself: python2 and python3 . Notice how we are not executing just python — instead we are explicitly supplying the version as well. This is due to how Homebrew now handles Python installs. In older versions of Homebrew, Homebrew would automatically alias the python command to either Python 2.7 or Python 3 — this is no longer the case. Instead, we need to explicitly supply the Python version number. The name is true for pip as well: we now use pip2 and pip3 . Next, let’s prepare our Python environment. Using a Python virtual environment is entirely optional but highly recommended as Python virtual environments are a best practice for Python development. 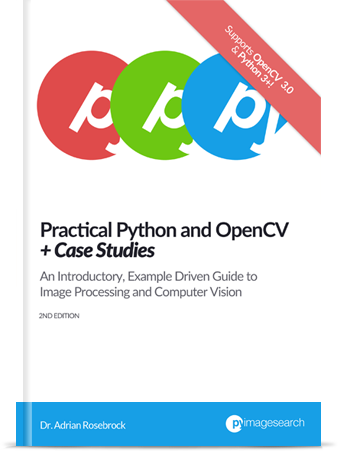 To learn more about Python virtual environments (and how to use them) please consult my OpenCV install tutorials where they are covered extensively. If you are not using Python virtual environments you’ll need to update the pip command to either pip2 or pip3 . If you are using Python 2.7, use pip2 instead of pip . Similarly, if you are utilizing Python 3, replace pip with pip3 . Figure 1: Successfully installing dlib on macOS. The following instructions were gathered on Ubuntu 16.04 but should work on newer versions of Ubuntu as well. We are installing GTK and X11 for GUI functionality inside dlib. These libraries can be skipped if you do not care about the GUI functionality, saving you 100-200MB in space. We install OpenBLAS for linear algebra optimizations which allows dlib functionality to execute faster. You can technically skip this as well but I highly recommend you install OpenBLAS as the optimizations are significant. Next, let’s prepare our Python environment for the dlib install. If you are not using a Python virtual environment make sure you add sudo to the beginning of the pip install commands (otherwise the pip install commands will fail due permission errors). Additionally, keep in mind that pip is used to install packages for Python 2.7 and pip3 is used for Python 3. Depending on which Python version you want to install dlib for you may need to update the pip command above. Figure 2: Installing dlib on Ubuntu (Note: I was SSH’d into an Ubuntu machine in the Amazon EC2 cloud from my macOS machine when taking this screenshot, hence why the screenshot looks like the macOS GUI). This section covers installing the dlib library on the Raspberry Pi and the Raspbian Stretch operating system. These instructions should work for newer releases of Rasbpian as well. Both Python 2.7 and Python 3 are pre-installed on Raspbian so we do not need to install them ourselves. We need to install libatlas-base-dev . We can optionally optimize our dlib install on the Raspberry Pi architecture via the USE_NEON_INSTRUCTIONS switch (this will require you install dlib from source rather than pip ). We are installing GTK and X11 for GUI functionality inside dlib. These libraries can be skipped if you do not care about the GUI functionality, saving you 100-200MB in space. Space can be a premium on the Raspberry Pi, but again, if you need GUI functionality make sure you install them. We install OpenBLAS for linear algebra optimizations which allows dlib functionality to execute faster. You can technically skip this as well but I highly recommend you install OpenBLAS as the optimizations are significant — any optimization you can achieve on the Raspberry Pi is well worth it! Next, let’s prepare our Python environment for the dlib install on our Raspberry Pi. Compiling from source will take longer than installing via pip so be patient. Note: The dlib install version for the Raspberry Pi is different from my macOS and Ubuntu output as I installed from source to leverage the NEON optimizations rather than installing via pip. Figure 3: Successfully installing dlib on the Raspberry Pi and Raspbian operating system. Note: This example assumes you have both OpenCV and dlib installed on your system. If you do not have OpenCV installed, please refer to my OpenCV install tutorials. For a detailed review of the code above used for facial landmark prediction, please refer to my previous tutorial on the basics of facial landmarks. Make sure you have installed OpenCV, dlib, and imutils ( pip install --upgrade imutils ). Use the “Downloads” section below to download the source code + example image + pre-trained dlib facial landmark predictor. Figure 4: Detecting facial landmarks using the dlib library and Python. Fun fact: The picture above is me ~8 years ago during my undergraduate college days. I actually had hair back then! Install OpenCV on your system as well (if you haven’t already). I have a number of OpenCV install tutorials for macOS, Ubuntu, and Raspbian available here. Use your OpenCV + dlib install to build practical, real-world projects. Figure 5: Using dlib to apply real-time facial landmark detector. 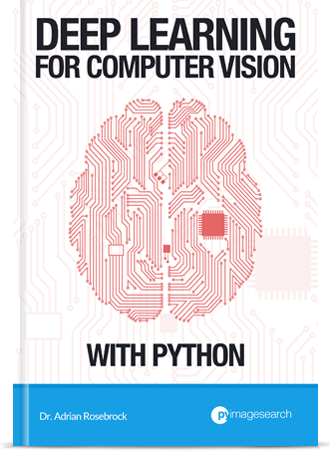 Figure 6: Building an eye blink detector with dlib, OpenCV, and Python. Figure 7: Creating a drowsiness detector with dlib, OpenCV, and Python. Be sure to take a look at the tutorials! 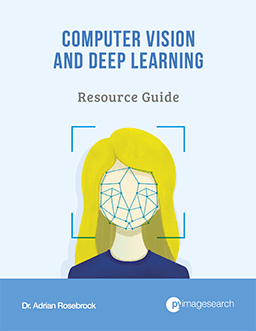 They are fun, hands-on, and will give you a ton of experience building real-world computer vision applications with dlib and OpenCV. In today’s blog post you learned how to install dlib on macOS, Ubuntu, and Raspbian. Thanks to the work of Davis King and Mischan Toos-Haus it is now easier than ever to install dlib, requiring less dependencies and a faster pip install process. Take a second now to give both Davis and Mischan a huge thanks for their hard work and their contributions to the open source community. I hope you enjoyed this blog post! To be notified when future PyImageSearch tutorials are published, be sure to enter your email address in the form below. For those with MS Operating systems, it is easy to install It assumes that your Python system has been installed. Where did you find the “Visual C++ 2015 Build Tools” ?? I tried to use “pip install dlib” and successfully download dlib, but I got cmake error (Could NOT find Threads (missing: Threads_FOUND). Is there any method I can take to solve this issue? Hey Steven — which operating system are you on? Thanks for the extra information, Steven. Unfortunately I’m not sure what would be causing that error. I would suggest posting on the official dlib GitHub Issues page where the developers can likely offer more insight. Thanks for your reply. I’ll try to report that. Thanks for the update Adrain. The easiest installation ever: With Anaconda. Python 3.6 and Ubuntu 16.04, I’ve installed dlib and pre-built opencv-contrib-python 3.4.0.12 using pip. 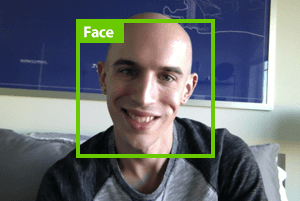 Your facial_landmarks.py run just fine. Congrats on getting up and running with dlib and OpenCV, Emanuel! Nice job. I have installed dlib as you instructed. I am getting version of dlib in interpreter as well. You need to use the “Downloads” section of this blog post to download the source code + shape_predictor_68_face_landmarks.dat file. From there, change directory to the download location and execute the facial landmarks script. Awesome, thanks for sharing Curtis! hello I followed the steps and installed dlib in a virtual environment with opencv 3.3 ( ubuntu 16.04) ,the Dlib installation indicates successful installation but when importing dlib the module is not found, What could be the problem? And ensure the compile + install process completes successfully. Thank you for the blog post. Dlib is cool. 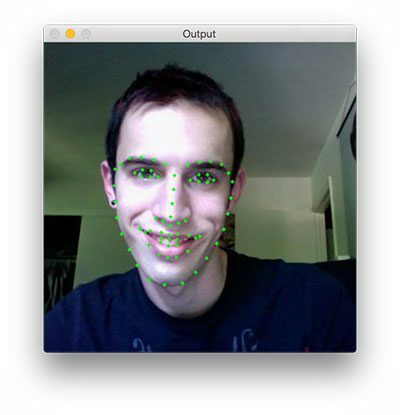 I was wondering what is the best way to capture the mouth area (between the lips) using opencv/dlib? Example app: when a user opens their mouth, I would like to color the mouth green for example. One approach is to put a rectangle around the mouth region and use threshholding and find contours (largest = mouth?). What approach do you recommend? You could compute the convex hull of the mouth region. This would give you the complete area of the mouth. Hey Ashwin, if you are having trouble installing or using dlib on Windows I would suggest posting on the dlib GitHub Issues page. Make sure you read up on command line arguments and you’ll be all set. It sounds like you do not have OpenCV installed on your system. Are you using Python virtual environments? If so, are you inside the environment? And did you install dlib into the Python virtual environment you used for OpenCV or a different one? When I using cmake to compile Dlib, how can I enable NEON optimization? I believe it should be the -mfpu=neon switch but you should check the official dlib GitHub/documentation. Thank you so much Adrian..Installed dlib in my Raspberry Pi 3b+ successfully Using the swap method and it took me 75 mins to install. Congrats on getting dlib installed on your Pi, Vamshi! The system is getting hanged and I need to restart the system again. Hey Akhil — it’s odd that your system is hanging. How much RAM does your system have? Is it a new-ish machine? Hey Reza, thanks for the comment; however, I must admit that I do not support Windows here on the PyImageSearch blog. If you are interested in computer vision and deep learning I would highly suggest you use a Unix-based machine such as Linux (Ubuntu) or macOS. so there isn’t any solution for installing dlib library on windows? Please specify some unofficial methods to install dlib on windows. Did anyone tried this for Windows 10, i am working on windows where python 2.7 is already installed. Please help how to install dlib?? How do I install this on virtual environment in linux without sudo? You would launch a root shell and follow the same instructions only from the /root directory as your “home” directory. Make sure you see my reply to Ashwin. Can u say, In total ubuntu 16.04 with tensorflow and dlib files uses how much space on the device ?? Hi Joe — I have not tried installing dlib via Python 3.7. I would recommend using Python 3.6 until other libraries catch up to Python 3.7. I am using raspberry pi and I am new to it. i tried to install dlib just as you explained but its taking forever to install. Are you compiling from source? If so, let your Raspberry Pi run overnight. I have problems installing my dlib I’ve read your tutorial dlib. I did the same things but again I can’t setup dlib my system. I’m using windows10. I tried to install it on my linux machine. still could not install. Hi Burak — I’m sorry to hear you are having issues installing dlib but please note that I do not officially support Windows here on the PyImageSearch blog. If you are having issues installing dlib in Windows you should post on their GitHub Issues page. and now i want to install dlib. i am in cv environment that i created (for OpenCV). How is it take to build? or i have to create a new environment and install dlib inside? Depending on your system specs it may take awhile to compile dlib. Be patient. I am having some issued getting dlib installed on my Raspberry Pi. First I tried installing from source with the “python setup.py install –yes USE_NEON_INSTRUCTIONS” . However in their most recent release notes (http://dlib.net/release_notes.html) they removed the –yes option from install so that command keeps failing. I tried pip install but it fails and then automatically tries to build from source which fails as will. Lastly I just tried to build from source with only the instructions “python setup.py install”. It ran for a long time, got to 91% and then just froze. I tried to log in remotely to the pi and could not as it had disconnected even though the screen still showed connection. Do you have any advice on how I could proceed? I just wanted to add that while installing from source on the Raspbian, I actually left it all night before it froze as I mentioned above. Have you tried increasing your swap space? 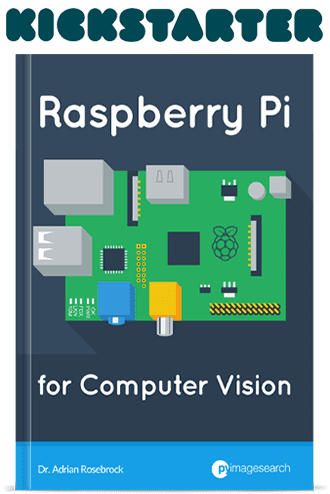 I discuss how to do that in this Raspberry Pi + OpenCV install post. You could do the same when installing dlib. pip install eventually worked for me. I am sticking with that for now. I may try installing from source later. Also it seems with the current dlib release, there is no need to use ‘USE_NEON_INSTRUCTIONS’ anymore; as this is done automatically. Thank you once again for being a great help. Hy Adrian, Hope you will be doing well. I have installed Dlib on my system following that link. But still dlib.DLIB_USE_CUDA returns False. My system’s GPU supports cuda. I want to compile Dlib with cuda support? Actually, I am using CNN based face detector of dlib, and it is too slow on live video stream. Therefore I want to use Dlib with cuda support to make it fast. Please help me to figure out mentioned issue. What type of GPU are you using? Have you tried posting the problem on dlib’s GitHub Issues page as well? I am using Nvidia 64MB GPU. .
No, I haven’t post it on dlib forum. Is it possible to help me out, if yes, please let me know? Which specific model GPU? Without knowing more information I cannot provide any suggestions. I would strongly encourage you to post on dlib’s GitHub Issues page and include as much information on your system, GPU, and install process as possible. Ok sure I will post the issue on dlib’s github issue page. Btw, I am using Geforce GTX 1080 . . . I am trying to install dlib onto an RPI 3 B+ with a 64GB micro SD card, used your instructions to install OpenCV 4. But every time I go for the dlib install it for Python 3 (with pip3) it either freezes (the clock stopped at 23:34 last night) or the wheels fail to install. Thoughts? It sounds like the Pi is definitely locking up. Have you increased your swap size?